Part of the Historic Triangle, Water Street is almost entirely terraces of mill cottages. Approach off Palmerston Street at the aqueduct or via High Street. Leads to Hazelhurst Drive, Foundry Street, John Street. 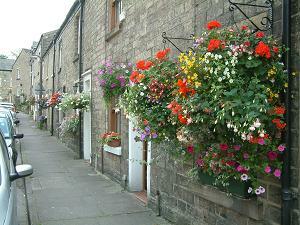 Water Street is famed for its stunning displays of window boxes and hanging baskets in the summer months. The picture shows 61 Water Street, the winner of the Cottage category in the Civic Society‘s Bollington in Bloom 2005 and again in 2006. The biggest building in the street is Water Street Centre , on the corner of Foundry Street, which was Bollington’s secondary school up to 1965. It has been substantially under used since then but has been taken over by Bollington Initiative Trust (BIT) for community purposes. In ‘the good old days’ there used to be several shops in Water Street and these can often be identified by the frontages. A cottage to the right of the school was once a beer house – the Lord Nelson. The war Memorial Gardens are located at the aqueduct end of the street. The first of the cottages here used to be a sweets and tobacco shop and still carries an enamel advertising panel above the door. This panel is protected by the Conservation Area status! This street is in the Bollington Conservation Area. Numbers 1, 5, 7, 8-56, 11-35, 35A-49, 53-75, 75A and 77A, and 77-81 are subject to Article 4 Direction. In 2007 considerable work was undertaken by the Historic Triangle project to improve Water Street. Setts were put in the side roads at junctions and in front of the memorial gardens, new heritage lamp standardswere installed and, most importantly, the roadway was re-surfaced!